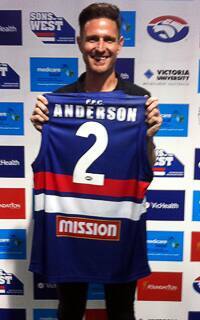 Long-time Western Bulldogs member and internationally acclaimed comedian Wil Anderson was yesterday appointed as a Club ambassador for season 2014. Anderson was announced as a Bulldogs ambassador at last night’s Sons of the West comedy event, where he performed for over 150 program participants from Melbourne’s West. The passionate Bulldogs supporter was presented with an official guernsey as part of last night’s proceedings, emblazoned with a number two in light of his favourite current player, Bob Murphy. Coming on board in an official capacity, the comedian will play a role in promoting and supporting the Bulldogs throughout the year through a range of Club events and initiatives.